Ordering at Starbuck’s can be intimidating, but if you have special dietary needs or are following a strict diet, then it can be downright frightening. 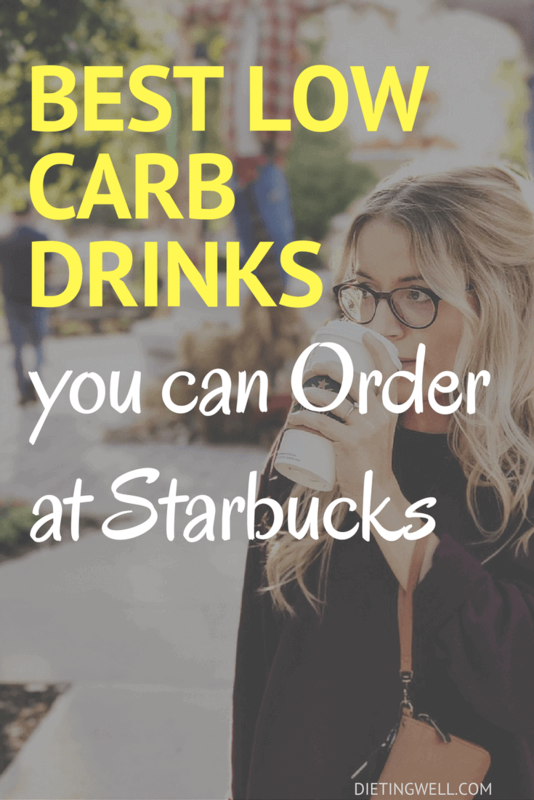 If you’re following a low carb diet, such as the keto diet, then you may think that you’ll need to forego your Starbuck’s fix for now. You may stare at the menu, wondering how to possibly enjoy your favorite drinks without ruining your diet. Many of the drinks they offer are full of sugar and carbs, but if you know how to order, there are several options that will help you stick to your low carb diet plan. The definition of low carb may be different to different people, depending on how many carbs you can consume per day. If you have any questions about the number of carbs in your drink, you can ask the barista how much of each ingredients he or she is adding to your drink. You can then calculate the number of carbs with any number of websites or apps on your phone. The things that add carbs are drink bases, the type of milk you use, and syrups. Luckily, there are ways to eliminate or reduce carbs. Your new drink might not be exactly the same as your old favorite drink, but you’ll be able to satisfy that Starbuck’s craving without sacrificing your daily carb limit. Unfortunately, if your favorite drink uses a base, like the frappuccino, then you may have to get creative when you order. But first, let’s discuss the basics of ordering coffee. Ordering coffee at any Starbuck’s can be an art form, but any barista can help you find the best options for your drink. The first decision that you’ll have to make is the size of your drink. Short is the smallest drink size at 8 ounces. It’s not listed on the menu, and you can only get hot drinks in this size. Kids drinks are available in this size, if you want an idea of how big the cup is. If you ask for a small drink, you’ll get the tall 12 ounce drink. Grande is a 16 ounce drink, and it’s available for both iced and hot drinks. If you order a medium, the barista will give you a grande. Venti has two different sizes: 20 ounces for hot drinks and 24 ounces for iced drinks. If you order a large, this is the size that you’ll get. Trenta, the 30 ounce drink, is only available for iced coffee and cold drinks. Those boxes on the side of your cup are in a certain order, so they prefer that you order in that way. Unless you specifically ask for a cold drink, you will get a hot drink. The default is a drink with caffeine. If you want a decaf drink, you’ll have to ask for it. The milk you order in your drink can affect the carb count, so be sure to order wisely. Heavy whipping cream has the least amount of carbs. Half and half has the next lowest amount of carbs. They also have soy milk and vanilla soy milk, but soy milk is generally not a good choice on a low carb diet because it generally has too many carbs for a low carb diet. Because the milk that you add can add carbs, it’s important to understand the differences between the different drinks that Starbuck’s serves. If you are trying to order a low carb drink, choose from the drinks on the bottom of the list above. Generally, the best option will be the Americano because it has the fewest number of carbs. If you love lattes or cappuccinos, there are ways to make them with fewer carbs. One the best low carbs drinks to order at Starbuck’s is a plain black coffee. There are no carbs in black coffee, so you can be sure that you’re following your eating plan. They are known for their coffee, so it’s always a good choice when ordering. Since they go through so much coffee, you’re almost guaranteed to have a fresh cup of coffee when you’re ordering. If you don’t like black coffee, then try adding heavy whipping cream to your drink. This type of milk has less than 1 gram of carbs per serving, so it’s the best option for cream. A coffee drink gets between three and six tablespoons of milk, and each tablespoon has 50 calories, so keep that in mind when ordering. You can also order a sugar free syrup to add some flavor to your coffee. There are no carbs in these syrups, so you can add as much as you’d like to flavor your drink. For a variation on the black coffee, try an iced coffee. Add heavy whipping cream or half and half for a creamy drink. You can also add sugar-free syrups for more flavor. Try mixing two or more syrups for more flavor options. Like coffee, espresso doesn’t have any carbs. Each shot of espresso is one ounce, and you can order more than one at a time. Just like coffee, you can flavor it with milk or sugar-free syrups. Espresso is stronger than coffee, so not many people see this as a viable option for a low carb diet. If you do like the flavor of espresso or just need some quick caffeine without much fuss, this is a great drink choice. Lattes are made with steamed milk, espresso, and foamed milk on the top. Made with whole milk, a venti has 23 grams of carbs, grande 18 grams of carbs, and a tall has 14 grams of carbs. If you order a skinny latte, they use skim milk for the milk choice. Skim has the most carbs of the milks, so ask for whole milk or heavy whipping cream instead to lower the carb count. The skinny mocha is made with a sugar-free mocha. It has some fiber in the recipe, which lowers the net carbs down to 18 for a venti, 14 for a grande, and 11 for a tall. Be sure to order this drink with whole milk, half and half, or heavy whipping cream instead of skim milk. Instead of ordering a latte, try ordering a hot or cold americano with just a little bit of heavy whipping cream. All Starbuck’s make their own whipped cream, so they all have heavy whipping cream. Add a sugar-free syrup if you want some more flavor. If you like a very creamy drink, order a latte and substitute heavy whipping cream and a shot or two of a sugar-free syrup. Again, this will be a very creamy drink. Most Starbuck’s now carry coconut milk or almond milk. Both of these milks have some carbs due to their sugar content, but they have fewer carbs than does milk. If you need to know the exact amount of carbs, ask the barista to see the container for the nutrition information. If a mocha is your favorite drink, you can still order it with some modifications. Try ordering a Skinny Mocha, but replace the skim milk with a combination of half heavy whipping cream and half water. You could also order with half and half if heavy whipping cream is too creamy for your taste. Another good substitution for a mocha is an Americano with a little bit of heavy whipping cream and skinny mocha sauce. You can also substitute almond milk or coconut milk if your store has them available. These milks do have some carbs, so be aware of that of that when ordering. For a little variation, try adding sugar-free peppermint with the skinny mocha sauce and a lower carb milk option. Iced tea and hot tea naturally don’t have any carbs. If you prefer a sweeter drink, you can add an artificial sweetener. Instead of a London Fog, try an Earl Gray tea with sugar-free vanilla and heavy whipping cream. If you love chai tea, order it with sugar-free mocha or sugar-free vanilla and heavy whipping cream or half and half. If you add milk to a tea drink, it’s best to use a black tea and not a fruity tea. The fruit teas can curdle the milk. Starbuck’s does offer a lower carb hot chocolate. Simply order with sugar-free vanilla, sugar-free mocha, and whole milk or heavy whipping cream. Unfortunately, no frappuccino is low carb friendly. They are all made with a base that comes to the store premixed, and this base is high in carbs. Even the sugar-free frappes are high in carbs and should be avoided if you are following a low carb diet. If you love a frappe and aren’t ready to give them up, you can still get a drink that’s close. Try ordering a coffee light frappuccino made with half heavy whipping cream and half water. This cuts down on the creamy taste without adding carbs. Add some sugar-free syrup for more flavor options. This drink will be higher in carbs than some other drinks you could order, so it’s best for those who are limited carbs but can still have quite a few per day. A caramel macchiato is a vanilla latte with caramel sauce on the top of it. Even if you order a sugar-free vanilla, the caramel sauce is not available in sugar-free, so it has a lot of carbs. The caramel sauce that they use is not the same as the caramel syrup, which is available in a sugar-free option. The sauce is thicker and, unfortunately, full of sugar. If you love caramel drinks, try ordering an americano with a sugar-free caramel syrup if it’s available in your store. Be sure to read the label of any bottled drink. Most are high in sugar and, therefore, not a good option for a low carb diet. All of their smoothies are high in carbs, so avoid these if you are on a low carb diet. When you’re ordering at Starbuck’s, the important thing to remember is that you’re getting carbs from syrups and milks. Most stores have sugar-free syrups available in the most popular flavors, so ask what flavors are available in your store. You’ll also find carbs in the milk. The lower the fat in the milk, the higher the carbs. Heavy whipping cream has the lowest number of carbs, so that’s the best option for a strict low carb diet. You can also choose half and half, which has slightly more carbs but is lower in calories. 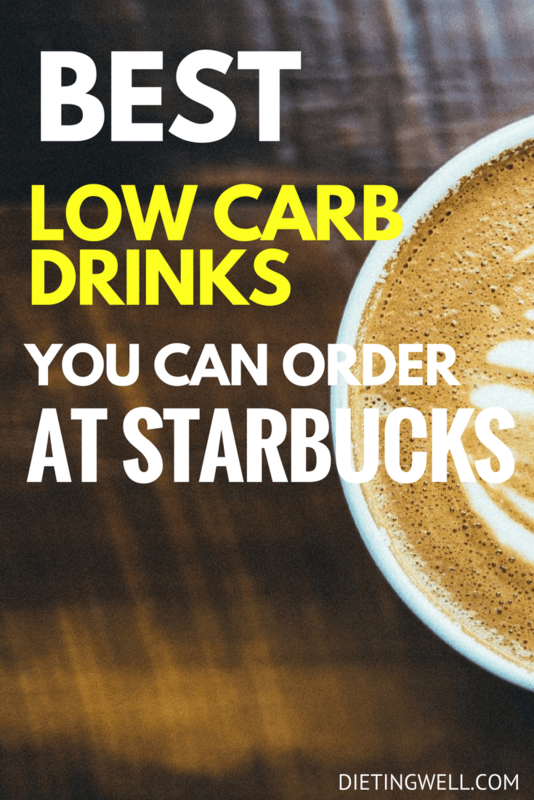 Now that you know how to create a low carb drink at Starbuck’s, have fun trying new drinks. If you’re stumped, ask your barista for advice. You’re not the only customer on a low carb diet, so he or she may have some recommendations for new drink ideas for you to try. What’s your favorite drink at starbucks? I would like a low carb (lowest carb you can get) Grande iced Carmel macchiato, how would I order that? TIA! So how much carbs would you say a skinny mocha with half the pumps, and half and half substitutes for the skim milk would be?